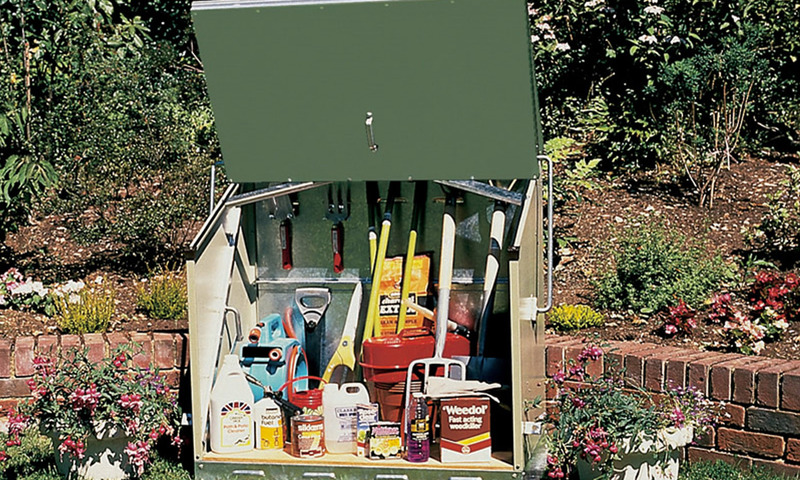 The Sentinel garden storage unit offers compact storage space for your garden items and is easy to use with "walk in" access. 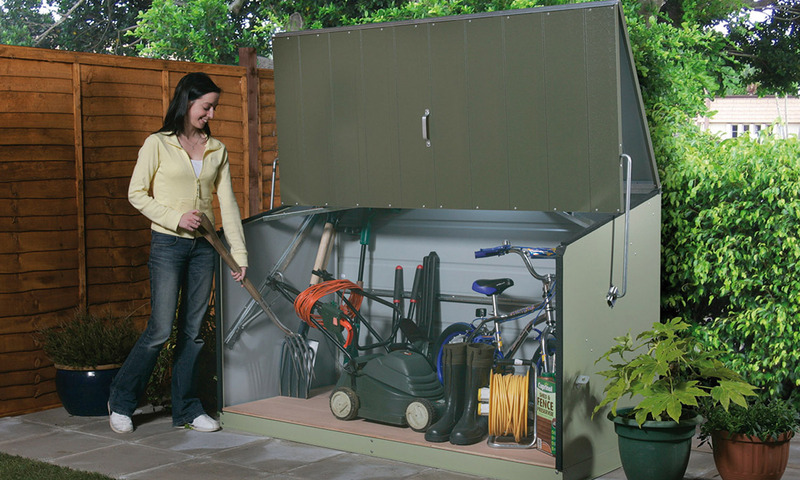 The Stowaway garden storage unit has an olive green roof and door, and moorland green sides giving you subtle garden storage. 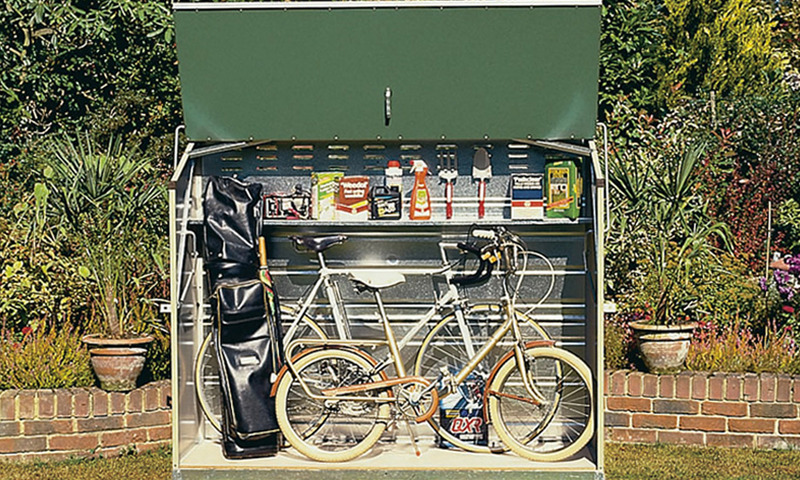 H 44.5" x W 54" x D 35"
The Storeguard garden storage unit is available in two-tone green or cream and is an ideal alternative to a shed where space is limited. 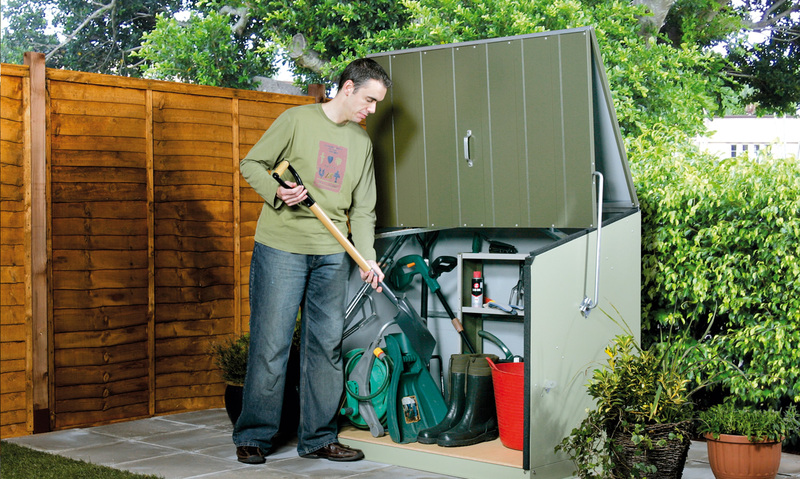 H 44.5" x W 77" x D 35"
The new Sesame storage unit is the latest addition to our garden storage range. It has virtually no lip or ramp at the front for simple storage of heavy or bulky items. H 54.5" x W 73" x D 30"
The Senator garden storage unit has a full length shelf and removable lower front panel to store a range of different sized garden items. 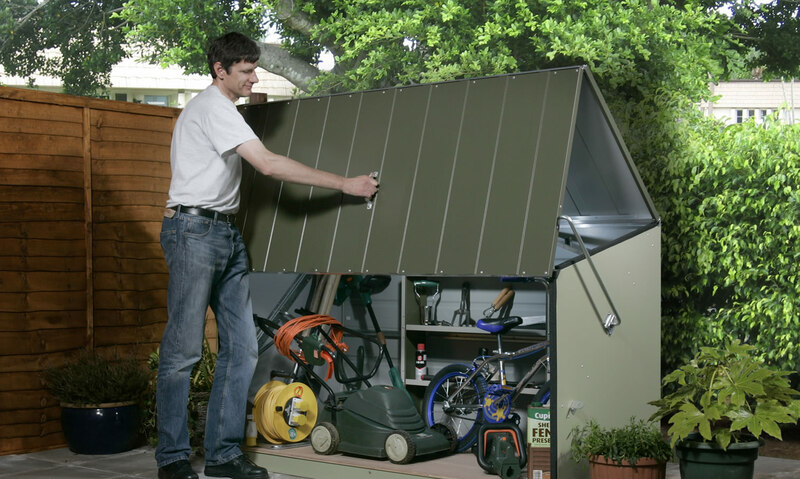 Garden storage units offer an excellent alternative or addition to a conventional shed, especially where space is limited. Due to their low profile and attractive designs our garden boxes and units can be sited almost anywhere in the garden, from the lawn to the concrete patio. One of the most important features of our stores is the unique and easy to use spring assisted opening action, which allows complete 'walk in' access. With this design, heavy or awkward lifting is all but eliminated as stored items are easily accessible. 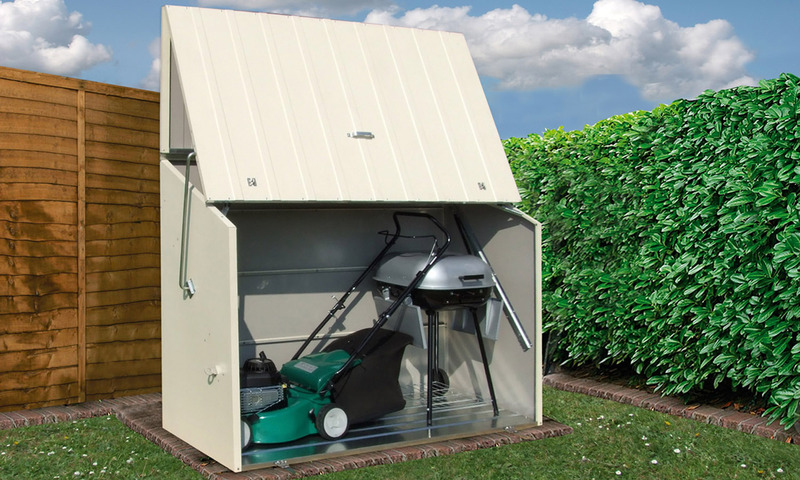 All garden storage units are manufactured in the UK using a modern PVC-coated galvanised steel which is maintenance-free, fire-resistant and guaranteed for 25 years, ensuring lasting good looks and trouble free use. Our storage units are supplied in a convenient flat pack and are extremely simple to construct as all major components are factory assembled for you. They come complete with all necessary fixings and easy to follow illustrated assembly instructions. Unlike wooden or plastic alternatives, all our garden stores are fire-resistant (a certificate is supplied with each product) and will not warp, become weak and brittle, crack or discolour over time, even in coastal locations thus offering better value for money long term. The unique all metal construction gives strength with security and now with the option of up to four padlock points, all stored items are very well protected. All of our garden storage boxes and units have many clear advantages over plastic or wooden boxes and are available in larger sizes too, making them ideal for storing bulky items such as outdoor furniture.